The Canadian Cancer Society is winning big, thanks to the Niagara Ice Dogs. The Ice Dogs wore pink jerseys for their game against the Flint Firebirds on January 19th. Those jerseys were auctioned off and raised a total of $18,000. On top of that, the Canadian Cancer Society collected coins between periods and held a chuck-a-puck fundraiser to raise another $4,000. 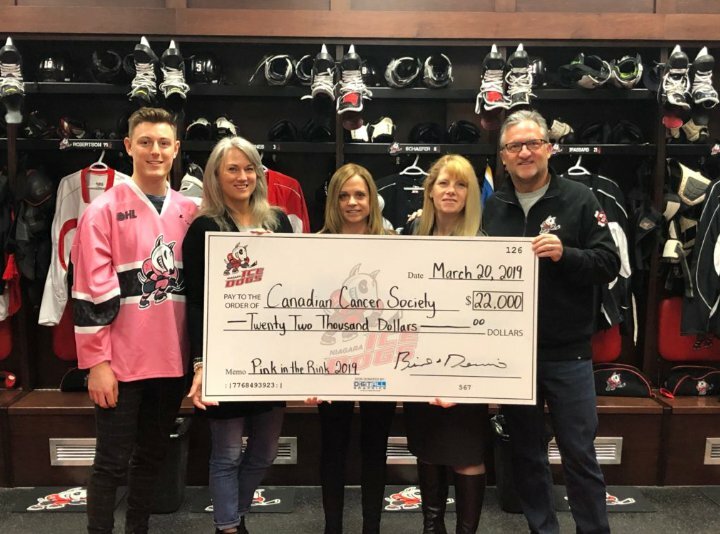 The Niagara Ice Dogs are donating a total of $22,000 to the local branch of the Canadian Cancer Society. The top selling jersey went for $900, and belonged to N-H-L draft eligible forward Philip Tomasino.